I have a coffee shop, a greasy spoon, really, that I like to frequent. I often go alone and catch up on my reading. The other usuals are there most mornings and I can catch a little town news. Well. A lot of town news. In the 15 years I've been going there, I've never gotten anything other than my "usual." Never. One egg, sunny side up on whole wheat toast, coffee. Many waitstaff and cooks have come and gone, but my usual has remained. In fact, I'll soon be unveiling a new blog called "I'll Have My Usual." I'll review breakfast restaurants across America using my "usual" as the yardstick. More about that later. About 4 years ago, the new owner of my local dive demanded all patrons receive a written bill. So the waitresses began coming to my table, whipping the pad out of their apron, asking "Your usual?" I'd heartily nod "Yes!" Sometimes I'd pause and respond thoughtfully, "I guess." I never saw what they wrote down until 2 more years later when the bill was left on my table. 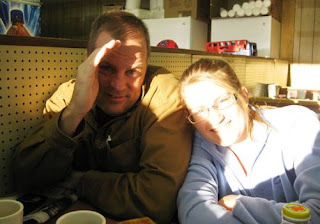 Fondly remembering my sister in law, Marilyn when she joined me at The Kwik Karry. Miss you and love you, Ma, the world is not the same. Love the KK....perhaps saturday am???? You guys took us there when we visited! 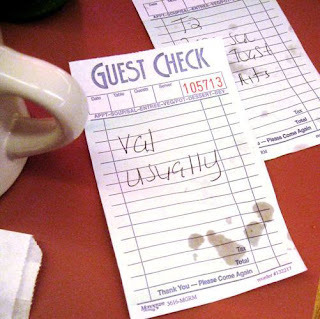 I bet you are getting a free "Val's usual" for this blog. Is this place like the Quick Fill gas station/mini market we got around here? Ummm, yes, it... it does happen to sell gas also.